Exit from your foundation row of beads or fabric. 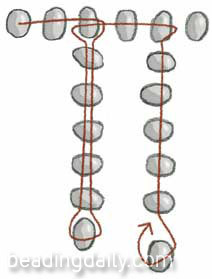 String a length of beads plus 1 bead. Skipping the last bead, pass back through all the beads just strung to create a fringe leg. Pass back into the foundation row or fabric.